When you hear ‘grilled cheese’, you probably think of a sandwich, and rightfully so – it’s a classic and childhood favorite among many. But I’m talking about cheese that you grill! As you know, if you put a soft cheese on a skewer, it will turn into a gooey, dripping mess when heated. A delicious mess, but a mess nonetheless. A hard cheese, on the other hand, will probably crumble before you can get the skewer through it, and even if you could, it would melt into an oily mass – not terribly appealing. No… I’m not talking about just any cheese. I’m talking about halloumi, a cheese with a high melting point that makes it perfectly suited for grilling. A semi-hard cheese from Cyprus (and popular in the Middle East) it’s brined and made from a mixture of goat and sheep’s milk, which gives it that wonderful and distinctive tang. If you’ve never tasted it before, it has a bit of that elastic mozzarella texture coupled with the salty tang of feta. You most certainly could use paneer instead of halloumi. Geographically speaking, it makes sense when paired with the green chutney and naan in this dish. A fresh cheese common in South Asia (specifically Indian, Pakistani, and Bangladeshi cuisine), paneer is frequently made with cow’s milk and so it’s generally less expensive than halloumi, but then lacks that tang the mixture of sheep and goat’s milk provides. I really like the briny-tang that halloumi adds to this dish, but feel free to use whichever grilling cheese you prefer – both are wonderful options. So a bit about the green chutney before I leave you to dream about perfectly grilled cheese. Also known as corriander chutney, it’s a popular condiment in Indian cuisine. It’s spicy, refreshing, and it works so well with so many things! Seriously, you’ll want to put this on everything – samosas, rice, bread, grilled meats, veggies, seafood… even sushi! When drizzled on the grilled cheese skewers and roasted tomatoes it ties everything together into one delicious bite! 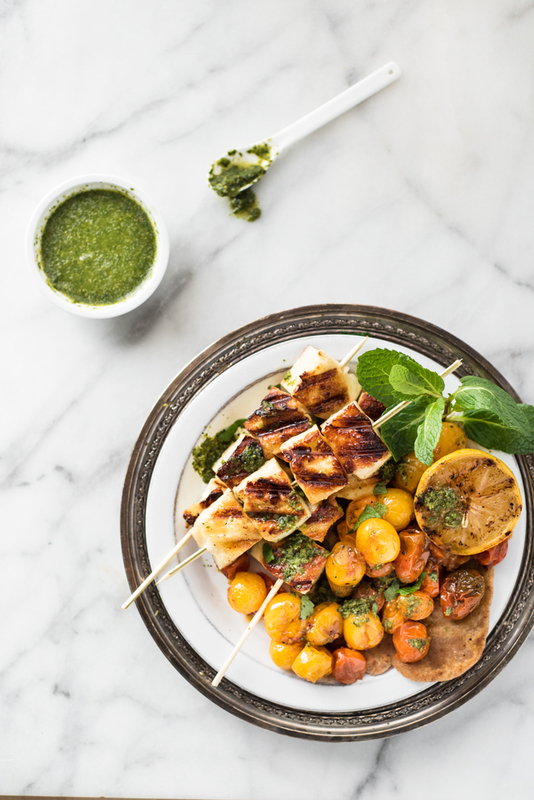 The ultimate grilled cheese - Halloumi Skewers with Roasted Tomatoes and a Spicy Green Chutney. Serve with warm Naan, and you've got one incredible meal! Add all of the ingredients for the Green Chutney to the bowl of a food processor. Slowly drizzle ¼ cup of water as you purée the contents. Scrape down the sides of the bowl as needed and add more water if necessary (it should be fairly loose). Cover and refrigerate until ready to use. Add the grape tomatoes to a baking sheet and drizzle with olive oil and season with salt and pepper. Roast in the oven for 15-20 minutes, until soft and blistered. 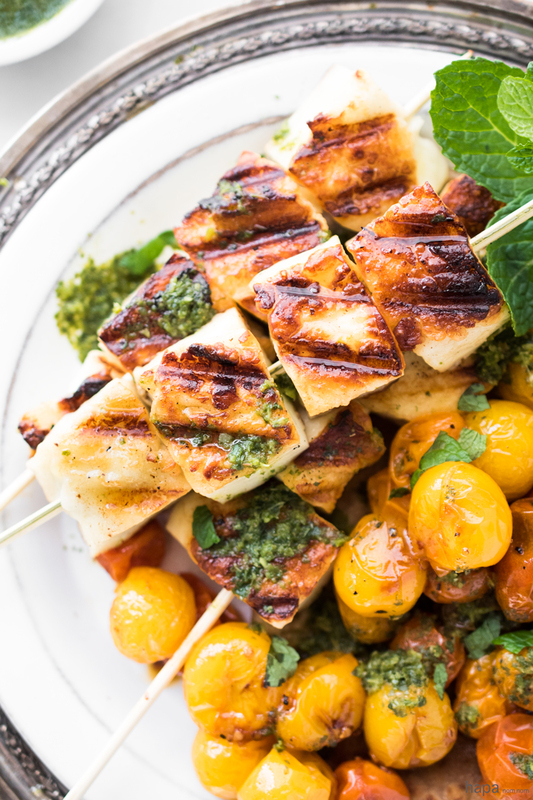 While the tomatoes are roasting, slice the halloumi into 1-inch cubes and thread onto skewers. Liberally oil a grill pan, heavy bottomed pan, or grill, and place over medium-high heat. Add the halloumi skewers and cook both sides until golden-brown, about 1 minute per side. 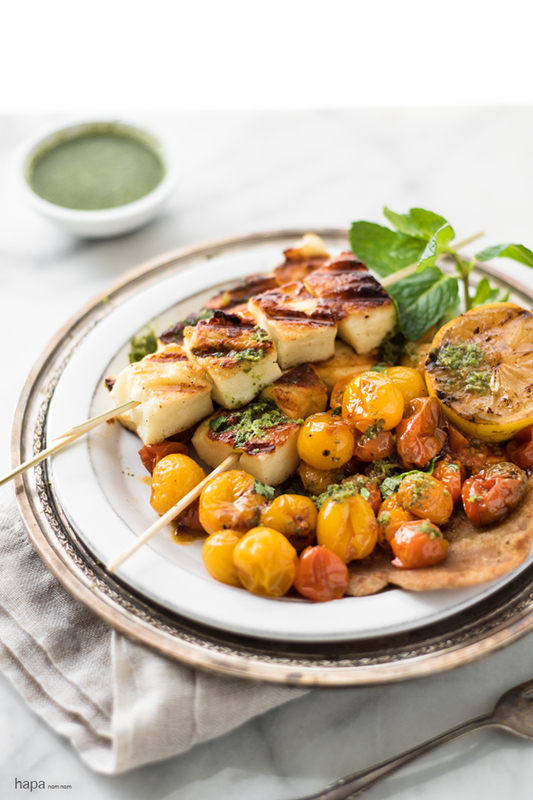 Serve the halloumi skewers with the roasted tomatoes, green chutney, torn mint, lemon, and naan. Serve and enjoy! * The Green Chutney can be made several days in advance - just cover and refrigerate. * Halloumi can be found in just about any neighborhood with a large Greek population, at most international markets, and cheese shops. If you don’t have one of those stores available, a Whole Foods or Wegmans will most likely carry it. Wow, Kathleen, this is the perfect way to celebrate Grilled Cheese Day! I love halloumi and any time there are tomatoes in the mix, I’m doing the happy dance. Your chutney is perfection!! Gorgeous photos as always, friend. You’re going to laugh… I seriously had no idea it was Grilled Cheese Day when I posted this! Yum, this combination sounds awesome. Love that chutney! I love Halloumi, just grilled some yesterday to add to a salad! This dish looks so delicious! Love the flavors! Pinning! Ooo… grilled halloumi on a bed of greens sounds delish! What a great way to jazz up your salad! Thanks, Anu! I added the garam masala at the very end, thinking the chutney needed a little something – it was perfect! It really is such a magical spice blend! I have yet to try halloumi but it sounds so good! This vegetarian dish looks like it has a lot flavor, especially with the green chuntney. I think I can put that on everything!! Oh my gosh, seriously, I put the green chutney on all sorts of things! So good! Oh I love that pleasant squeak and salty goodness of halloumi! And I’m entirely intrigued by your green chutney! I’m embarrassed to confess I have not tried halloumi. But I am SO going to try it now that I have laid my eyes on these beauties. I am hungry!!! You know, I don’t think I’ve ever had halloumi and now I realize I’ve been missing out all these years. These skewers are calling my name and the thought of that green chutney is making my mouth water! Gorgeous dish!